Pry bars or crowbars have been a favorite tool since the 20th century. In fact, they are one of the simplest yet most effective means to remove materials. These materials can be nails, wood, and even metal. In my opinion, every homeowner should have the best pry bar stored somewhere in your house. It’s such a handy and versatile tool that costs so little. Moreover, even if you don’t need it, it’s a good melee weapon for self-defense in case you’re life is in danger! 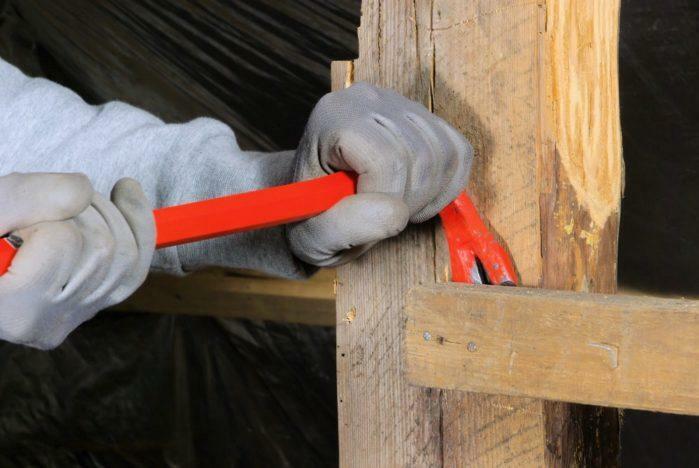 Pry bars or also known as crowbars can be taken literally with how they function. These handheld tools are bars of steel that curve at the end. Usually, the curve at the end of the crowbar resembles a hook with two pointed ends sticking out. That allows it to pry things out of certain surfaces. One of the most common applications of a pry bar is removing nails. Thus, this works similarly to the hook of a hammer’s opposite end. 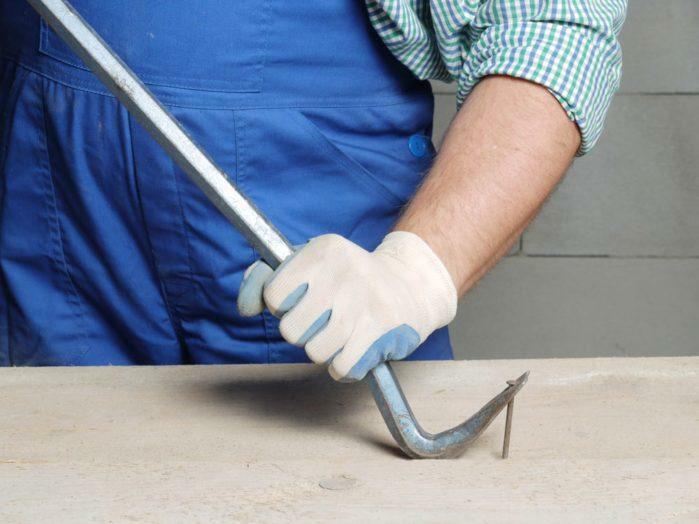 By placing the stuck nail in between the hooks of the crowbar, you can take it out since it locks into the pin. Now, you might think that pry bars are not necessary because hammers already have that. However, that’s where most people fail to see its other benefit, which is its length. Unlike the hammer, a pry bar gives you more leverage. It is just basic physics, particularly the lever mechanism. The longer the distance of the force towards the receiving end, the stronger the force applied. The crowbar is suitable as a class 1 lever, which is the fulcrum mechanism. Still, it’s versatile enough to be used in all three categories of a lever. It means that you’ll be able to pry out nails quicker using a crowbar. Further, you can step on the surface and use that as additional leverage when removing nails. The right size of the crowbar allows you to remove things using the entire force of your body, not just your hands. Despite the pry bar being best known for its nail removal, it’s also great to use to destroy things. Pry bars are convenient tools to have if you’re planning to do some demolition to your house or garden. One of the best uses is to remove wood joineries and other thin flat surfaces. For example, if you’re trying to demolish a chicken coop, you can use the pry bar to rip apart the wood instantly. Since it packs a punch, it’s an excellent tool to use to split wood as well. The hooks it has are sharp enough to grapple something. It’s almost similar to a harpoon. With that said, it can fight joints, and with a little force, you can split the joineries instantly. Some pry bars are also used by demolishers to wreck hollow blocks and other thin cement surfaces. Depending on the material (which we will talk about in awhile), pry bars are sturdy as smashers too. This wrecking capacity of a pry bar made it a favorite tool for criminals, however. 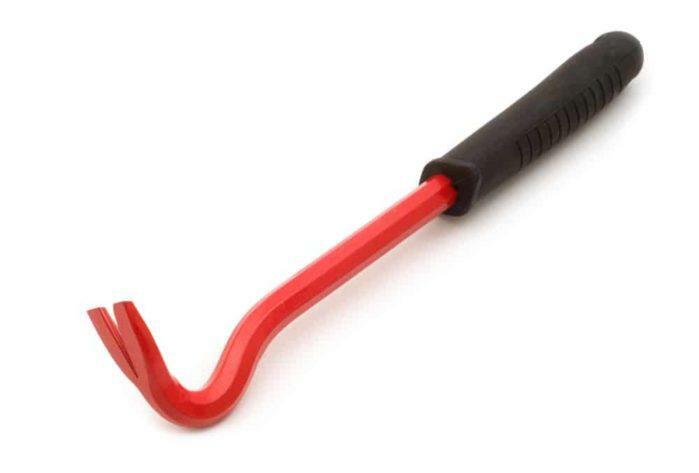 There are a lot of incidents where criminals use pry bars to rip wooden doors and take out locks. They even used it to shatter glass and other joineries. That said, always survey your house and neighborhood since a pry bar is readily available to anyone. With that in mind, don’t be afraid to use a pry bar as a means of self-defense as well! Buying a pry bar is a straightforward task. It’s a single tool that doesn’t have any subparts, which is why durability here isn’t an issue. However, if you are using it for heavier work, the material matters a lot. Depending on the manufacturer, pry bars can come from all sorts of metal. However, the key here is to get the highest quality with the best price available. Some of the most common yet most useful material is medium carbon steel. Another durable material that you can consider is titanium. Titanium works well with the pry bar’s functionality. That is because it provides you an alternative to having a non-magnetic and lighter. That means it’s a lot better to have if you’re always on the go. Still, in the end, the most important thing is to have a pry bar that’s rustproof. Many cheap crowbars can rust over time. Thus, you should look for brands that boast anti-rust technology on their product. A rusty pry bar will not only mean danger but also less efficiency in work. Next up is the dimension of the pry bar. As we previously mentioned, the best benefit that you can get with using a pry bar is more leverage. However, longer isn’t always better with a pry bar. The best thing to do here is test one for yourself. How long do you feel comfortable in using your pry bar? Do you need it shorter or do you want a very long one? Many factors come into play here such as your wingspan and the kind of work you’re doing. Since we’re in the 21st century, a lot of innovation has occurred, and that’s right with the pry bar as well. Even though it’s a simple tool, many manufacturers have added extra features that you’d want to have. Some of this includes a rubberized and ergonomic handle. Pry bars back then are pure metal. However, you can find products nowadays that have rubber handles. It’s quite similar to the handle of a screwdriver. That is a big plus since you won’t have to worry about dirty and bruised hands afterward. Besides the handle, some pry bars also have changed their hooking system. Some bars have tighter spaces, while others have more than two pointed tips. All of these have different benefits for certain jobs. The key here is to know the purpose of the tool. Tekton’s 15 inch Utility Pry Bar also comes in a 7.5 inch and 18-inch size to cater to your project needs. It has three nail slots, one at each end and one in the middle. That can let you get nails from any angle. The tips are also sharp and chiseled, making it easy for you to slide into even the tightest cracks and crevices. But most importantly, its steel construction is high strength forged and heat treated. It is also rust and corrosion resistant due to its enamel finish. 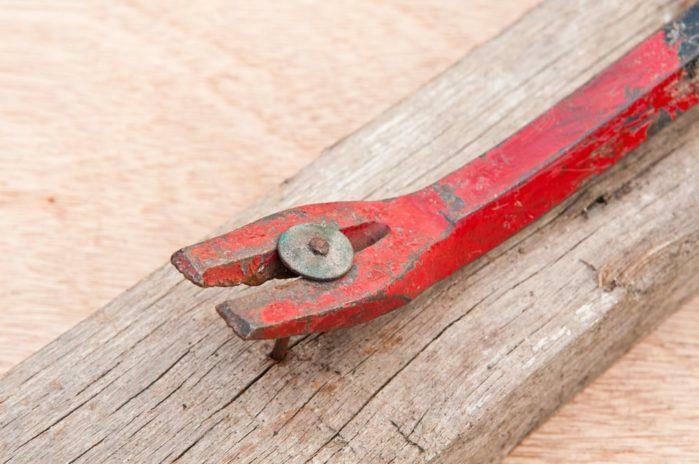 Tekton offers a replacement tool or spare parts in case you ever encounter problems. You just have to call their customer service. It can withstand even rough use. It also comes in other sizes that you can buy, making it very flexible and versatile. It maybe a little sharp in the edges so you’d have to be extra careful when getting it or storing it away. It can be a little “springy,” especially when getting nails. As for Superbar’s Vaughan 15 Inch Long Original Pry Bar, you get a forged and spring tempered steel constructed tool that can provide good leverage. The “shepherd's crook” rocker head can provide you maximum prying power. That makes it ideal for both homeowners and merchants to use. Similar to Tekton’s, it also comes with three beveled nail slots and polished, sharp blades for hard to reach areas. It is very well made and durable. Also, it is durable enough for demolitions and pallet dismantling. The size and design are perfect for bringing outside project sites. If you prefer pry bars that do not have designs, the sticker might be a little annoying. It does not come with a warranty/guarantee. Stanley enters our list with its 36-inch FatMax. The FatMax labeled as a “wrecking bar,” has a heavy duty material is perfect for the job. Particularly, FatMax has a forged high-carbon steel material that’s more than capable of demolition jobs. The length is also another great factor to consider here. The 36 inches that you get is more than enough leverage to wreck walls and split nails. Add to that the excellent reputation of Stanley, and this pry bar might be for you. Tekton makes a return to our list with its 5-piece set, being the first set of pry bars on this list. Unlike the previous Tekton pry bar, this set has small pry bars but with better handles. One of the things that will grab your attention here is the sleek and durable handle. The handles of Tekton comes with poly plastic. These give your hands an ergonomic feel which will translate to better and safer use. Besides the comfy handles, Tekton also retains its solid construction of its metal pry bars. The pry bars work best for medium to small scale projects and demolitions. Titan Tools finish our list with its stainless steel pry bar with an extra added set. Titan tools make use of rigid construction, which makes your work a lot efficient. However, the best part about this tool is that it’s a double-edged sword. One end of the crowbar is a flat but sturdy prying edge. On the other end, you get a scraper. Scrapers are another convenient tool that’s suitable for removing paint, dirt, and other grunge. That is perfect for professionals like woodworkers who also engage on surface removal or repair. When taking pry bars into account on your shopping list, material, weight, and strength are key factors. With that said, this list has a close race when it comes to the best pry bar. All products have their fair share of uses, and it all depends on how you’re going to use it. However, with the right blend of lightweight, durability, and strength, Tekton’s utility pry bar wins this one. It has a true versatility for other purposes, while also being robust enough to be used traditionally. It’s also light and easy to use. On the flip side, if you’re more into demolition, the 36-inch Stanley is another pry bar to have. It’s more than twice the size of Tekton’s utility bar, and it packs a punch for taking down those cumbersome walls! If you found this informative, don’t forget to leave a comment below and share it with your friends. Good luck! How to Fix a Door That Won’t Stay Open With 3 of the Best Ways: Pesky Door No More! My husband has been excited about home projects recently and has gotten me involved, which is actually pretty fun. I appreciate your advice here about choosing the right pry bar and that a common and useful material for a pry bar is medium carbon steel. We definitely want one that is good quality for a lower cost, and one like that would be great.